for more than ten years. we are professional forged steel and cast steel valve manufacture in China.We have passed the certificate of ISO9001,API and CE. We have high quality products, and reasonable price. Our main products:Gate Valve, Globe Valve, Check Valve, Ball Valve, Y-Globe Valve, Y-Strainer, Needle Valve,Knife gate valve,low temperature valve,belows valve,marine valves etc. 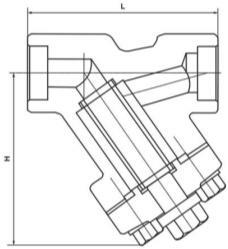 Nominal Pressure:PN1.6~42.0Mpa( 150lb ~ 2500lb ). Materials: A105, LF2, F5, F11, F22, F304, F 304L , F316, F 316L , WCB, WC6, WC9, CF 8M , CF3, CF 3M etc. Meanwhile, we can also accept customer's OEM order. If you have any special requirement, welcome to contact us. We will reply to you ASAP. Looking forward to your further enquiry!